HIV Cure Is Closer As Patient's Full Recovery Inspires New Research : Shots - Health News After Timothy Ray Brown became the first person to be cured of HIV, scientists became more optimistic that they could find other ways to cure patients. Two of the most promising possibilities include a vaccine and gene therapy that would re-engineer the immune system. Ask AIDS researchers why they think a cure to the disease is possible and the first response is "the Berlin patient." 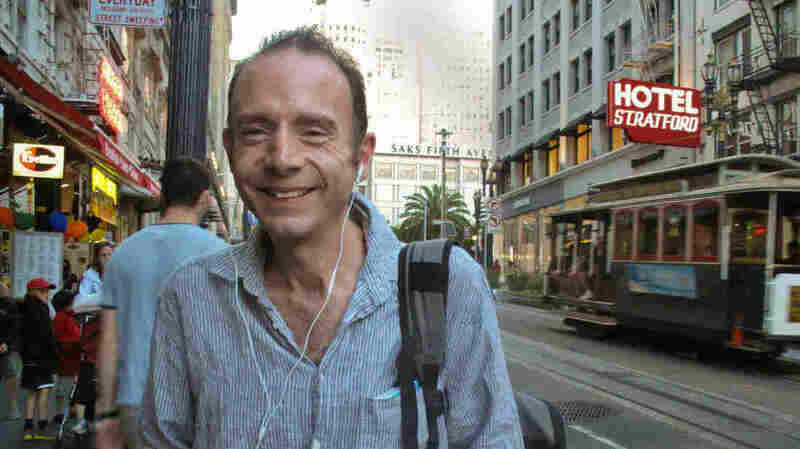 That patient is a wiry, 46-year-old American from Seattle named Timothy Ray Brown. He got a bone marrow transplant five years ago when he was living in Berlin. Brown, who now lives in San Francisco, is something of a rock star in the AIDS community. He has made himself endlessly available to researchers, who regularly bleed and biopsy him to learn as much as possible about his amazing cure. "I have sort of a guilt feeling about being the only person in the world who's been cured so far," Brown said in an interview with NPR. "I'd like to dispel that guilt feeling by making sure that other people are cured." The transplant was to cure leukemia unrelated to his HIV infection. The German doctors gave Brown a new immune system from a bone marrow donor who is immune to HIV by virtue of a genetic mutation shared by 1 percent of Caucasians. Brown stopped taking his HIV drugs at the time of the transplant. Five years later, he's still free of HIV drugs — and apparently free of HIV. And he's still the only person to be cured of HIV, doctors say, although everyone acknowledges that bone marrow transplantation is not something that could be used routinely for this purpose. Dr. Steven Deeks at San Francisco General Hospital is following Timothy Brown closely. He's an organizer of a two-day symposium on curing HIV this week in advance of the International AIDS Conference in Washington, D.C.
Until recently, Deeks says, it was virtually taboo to use "HIV" and "cure" in the same sentence. "It was the C-word," he says. "It was something that we weren't allowed to talk about. We weren't allowed to pursue. I'm not entirely sure why it got to that point." One big reason is research back in the late 1990s that showed how HIV hides out in certain immune cells. They're called memory cells because they contain a memory of all the infections we encounter in life. They stand ready to attack if a germ reappears. "HIV has really taken advantage of this very fundamental aspect of the immune system and found a way to essentially hide in these long-lived T-cells," says Robert Siliciano, a professor of medicine at Johns Hopkins University. Years ago, Siliciano showed that HIV-infected memory cells hang around for 60 or 70 years — basically, a lifetime. But the virus invariably roars to life again as soon as somebody stops taking antiviral drugs. "People actually began to think this was not going to be a problem that we could solve in the foreseeable future," Siliciano said in an interview. That's changed. Lately Siliciano and others have discovered that some drugs — such as one that treats alcoholism, another that fights cancer — can wake up the sleeping cells and cause them to spit out hidden AIDS viruses. The goal is to purge HIV from its secret reservoirs throughout the body. Scientists hoped the memory cells that harbored them would be killed in the process, wiping out the HIV reservoirs. Unfortunately, they were wrong. "That's been one of the recent discoveries that's been a little bit discouraging," Siliciano says. "Some of the drugs we thought would turn on latent HIV in fact do that, but the cells don't die. Nor are they readily killed by the immune system." Researchers think it might be possible to make a vaccine that would prime the immune system to mop up infected HIV cells after a drug smokes the virus out. Researchers are also on the trail of drugs that are more efficient at purging HIV. Nurse Priscila-Grace Gonzaga with Gregg Cassin, a San Francisco gay man who has been infected with HIV since the early 1980s. He's a volunteer in a cutting-edge gene therapy experiment to see whether HIV-infected people can be given an immune system that is invulnerable to HIV infection. Other scientists are pursuing a different approach — gene therapy. It aims to re-create the Berlin patient's cure, without a risky and expensive bone marrow transplant. Gregg Cassin is a human guinea pig in an experiment sponsored by Sangamo Biosciences, a California-based company. His experience provides a tantalizing clue that gene therapy against HIV might work. Cassin thinks he got HIV in the early 1980s. He didn't start antiviral treatment until his immune cell counts plunged to near-zero. He's watched many friends get sick and die from AIDS while he's remained healthy. Last year Cassin volunteered for the gene therapy experiment. "I wanted to get into the next exciting thing in research," he says, "and completely by accident, I found out I had one of these mutations, the CCR5 mutation." That's the same mutation that Brown's bone marrow donor had — the genetic quirk that makes him immune to HIV. But Cassin has only one out of two possible mutations, while the Berlin patient's donor has both. So Cassin is only partly protected. But it may explain why he has survived so many years of HIV infection without treatment. In the gene therapy trial, researchers took out some of Cassin's immune cells and treated them with a chemical called a zinc-finger protease that knocks out both CCR5 genes. Then they grew billions of these engineered cells and injected them back into Cassin. After a few weeks, according to plan, Cassin stopped taking anti-HIV drugs. He was off therapy for several weeks. But then he panicked. "This is the part I feel a little bit bad about, a little embarrassed about," Cassin says. "But my viral load shot up, and I got nervous. So I went back onto treatment." He may have panicked too soon. Two weeks later, Cassin got the results of his latest blood test, which had been done just before he resumed treatment. It showed the amount of HIV in his blood had started to drop sharply, even without antiviral drugs in his system. "My body was taking care of it," he says. Scientists will never know whether his viral load, as it's called, would have continued to drop, as Brown's did after a similar initial spike. That will take many more patients who have more definite and lasting benefits. The same goes for other would-be cures. Most researchers think in the end the answer will be a combination of approaches. Meanwhile, Brown is still teaching scientists lessons. Recent research suggests a few of his cells may still contain traces of HIV, or rather, HIV genes. But if that's true, researcher Deeks says it doesn't seem to matter. "The consensus on what actually happened," Deeks says, "is that he's cured clinically. Whether there's any virus left, we're not sure. But we can't detect anything that can replicate, and his immune system is no longer really responding to the virus. Which to us suggests that the virus must be almost gone." If so, "almost gone" may be good enough — and that's an important insight. As they say, more research is needed. I asked Brown if he's going to put up with being poked and prodded for years to come. "I think so," he says. "Until there's a cure, I'm going to keep working for it. And well, hopefully, one day I won't have to do it any more" because he'll be just one of many cured of HIV. "That would be nice," he says.